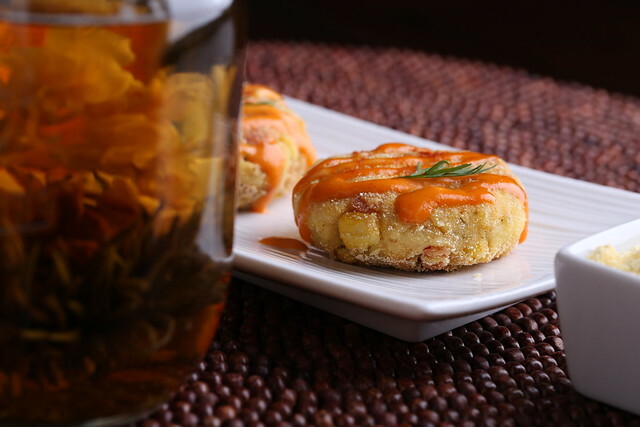 Have you ever tried using corn flour? Not cornmeal, which is its grainier counterpart and one word, but corn flour, which is a finer powder, and two words. Except if you are in the UK, where cornstarch is called cornflour, which I find to be horribly confusing. I bought this product by mistake after reaching for chickpea flour, which looks pretty similar in the package. I assumed this powdery flour would yield a light result, so the first time I used it was in a pancake batter along with regular AP flour. The results were tragic: inedible and ugly brick pancakes stomped out of the skillet, with a rubbery yet dry texture that I’d never seen before. But rather than throw the flour away, I tried it again, using it as a coating for falafel. I rolled some of the falafel spheres in the corn flour, dunked it into some hot oil, and they emerged with a crispy, light and golden shell. I also tried it again in a pancake batter, but scaled the amount back to one tablespoon, which yielded a lighter, cornbread-scented result. 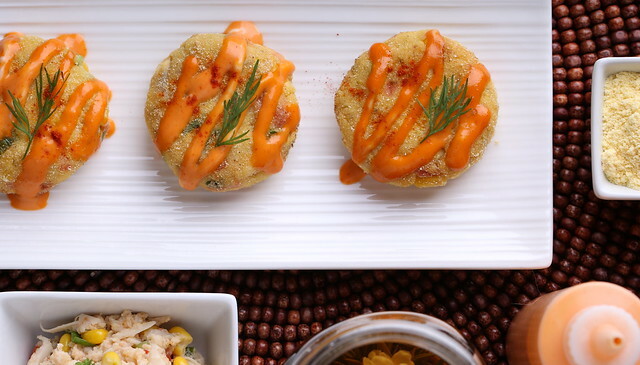 These experiments led me to use the corn flour as a coating on hearts of palm-based crab cakes. Hearts of palm is a new-to-me ingredient, although I’ve seen it in salad bars and used in faux crab cakes frequently. After giving it a rough chop, this product yields a flaky, faux-crabby texture that’s easy to combine with other chunky components.The outer layer of corn flour here complements the other flavors and textures perfectly, and produces a nicely textured shell that breaks easily with the tap of a fork. Place the hearts of palm into a food processor and pulse three times. You'll want the mixture to be broken up, but still a little chunky. (You can also gently mash with a fork.) Transfer the the mixture to a medium-sized bowl. Add the Old Bay, dill and salt and gently stir to coat. Fold in the rest of the crab cake ingredients. Cover and allow to refrigerate for about an hour or up to overnight. 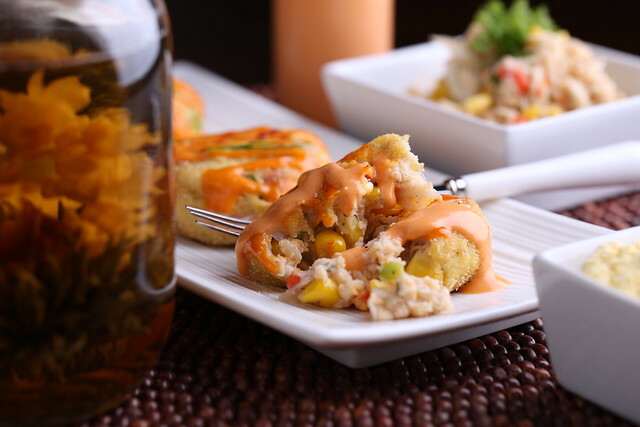 When you are ready to make the crab cakes, place the corn flour into a shallow wide bowl. Place a pan (preferably cast iron) over medium heat for about 3 minutes. While you are preheating your pan, divide the crab cake mixture in half, then form 3 equal portions from each half to create 6 equal-sized portions. Roll them into balls, then flatten them out between your palms a bit. Gently place them, one by one, into the corn flour until well coated, tapping off any extra. They will be really fragile, so if they break apart, just gently reshape and redust with the flour as needed. Coat the bottom of the pan with oil, wait one minute, then gently place the crab cakes into the hot pan. Pan fry for 2-3 minutes on each side or until golden brown. Transfer to paper towels to slightly drain. You can also bake these crab cakes. Just preheat a cast iron pan in a 450 degree oven. Drizzle the bottom of the pan with oil and place the dusted crab cakes into it. Flip so the tops are slightly oiled, and bake on each side for 15-20 minutes, until golden brown. Serve immediately with the sriracha-Vegenaise, dill-Vegenaise or other prepared dressing. Old Bay is magic. I hope you enjoy! Out of all the food blogs I subscribe to yours is by far the most sophisticated. I CANNOT wait to try these “seafood” recipes. THANK YOU! Gorgeous! I honestly don't know if I've had hearts of palm but I've definitely seen them and can totally see how the texture would work for these. They seriously look amazing. I grew up eating hearts of palm and to this day treat myself to a can of it every so often. These look delicious! I have a ton of corn flour in my pantry! These look really delicious and I have never had hearts of palm. I'm looking at the amount the recipe made, and I'm thinking that dividing it into 6 patties is going to make them very small, no? Johanna, dividing the mix into 6 patties makes nicely sized cakes, partially because they are fragile and will hold up better in the pan at this size. Also, I'm thinking that mixing a little panko (I used whole wheat) into the corn flour might be nice (?). I didn't have corn flour and used Panko instead, they were great! Oh yum. I love hearts of palm crab cakes, and your recipe looks really good! So this was my indulgence for this evening's menu. Which comes with a funny story I thought I would share. I had no corn flour on hand and could not find any on island. So I thought of using some other kind of flour–but then thought maybe I would try something a little different. I wondered if dry polenta would have a similar effect when coated on the cakes and fried. Well…it was an interesting experiment! I liked the grittier texture it produced on the outside, but I must say that frying them was a walk on the wild side. Thankfully, for some reason, I thought to cover the pan though you had not mentioned it. Not sure why I did it; must have been someone looking out for me;) The cakes began to sputter and pop intensely–painting the whole underside of the glass cover. I turned the heat down from medium to low-med. yet it still spat up a storm to the point that I shut off the burner and had to wait a few minutes before lifting the lid or I surely would have been blinded by flying grease. I chuckled at what I anticipated was going to be a disaster. Strangely, when the pan settled enough for me to lift the lid, the underside was nice and golden crisp–so I decided to keep going, though kept the heat at low-med. and the cover on, and then turning off the burner and letting the cakes sit for a couple minutes before flipping them or removing them from the pan. In the end–the taste was still wonderful and the recipe was not destroyed, not did I lose my eyes in the process. 🙂 Delicious as always. I was surprised at the comparative taste without having added any crushed nori or anything. I added a touch of lemon juice and dried lemon peel to the sauce and served the cakes on a bed of fresh baby spinach with a side of pine nut cous cous topped with edemame. Thank you for another culinary adventure! I'm going to make these tonight — I'm so excited! Amazing…can't wait to try these!!! I'm making this for a second time. Of the first batch, I had one. 4 went to a friend's restaurant for sampling, and they loved them. The last one was consumed by my dearest, who insisted I make them again, so that he could have more. I'm going to pair them with a recipe from the book, Vedge: Dandelion Greens Horta with Skordalia. Thanks so much for making these, Johanna and also for sharing them! I am overjoyed that they were a success. Many thanks for your kind feedback! This looks amazing, just like everything you present here. I can't wait to try these. I've actually had an idea in the works that involves dehydrated hearts of palm being made into vegan calamari. I can't wait to try these! i've had heart of palm cakes at Crossroads- these look just as good! I'm always nervous to try any recipe I find on pinterest because I've just had so many interesting experiences. However, I made these for a Christmas eve dinner that was seafood themed and they were a huge hit!!!! I thought the crab mix was a little salty for my personal tastes, so I added some more breadcrumbs and just the smallest touch of water, but they held together perfectly and seriously everybody loved them and thought they tasted like crab. Thanks so much for posting this and I can't wait to try more of your recipes! 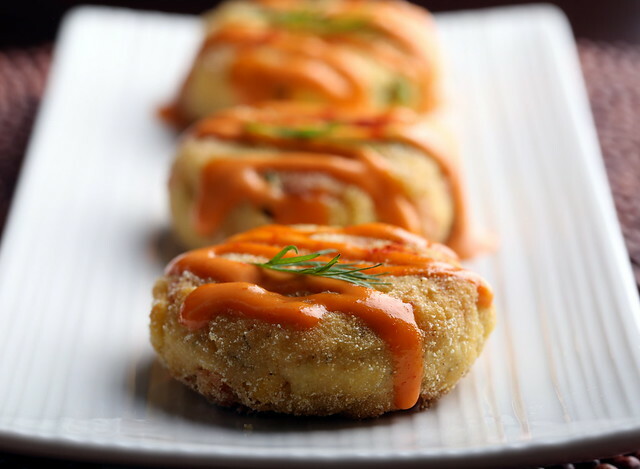 Thank you so much for making the crab cakes and for your kind feedback—I am thrilled they were a hit! Hearts of palm is an incredible ingredient. This recipe is wonderful. I made these for lunch and my family devoured them! I have already made more patties for tomorrow's lunch. Thank you so much. This will make our transition to plant based much easier! So happy you and your family enjoyed, thanks for your feedback! Moment cafe in St. Augustine, FL. They served them on fried green tomatoes with a fresh salad and homemade raspberry vinaigrette. We just have to make these!!! Thanks for the recipe! They look great! I'll serve them for dinner tonight. Like others, I swapped in a few things: a scant 1/4 cup of silken tofu I had because they seemed a bit dry; chopped homegrown parsley for the scallions, and some extra Old Bay and dry mustard instead of the extra salt. They came out lovely! I had a piece that fell off, and it was delicious. My on I husband won't eat this sort of thing, but I'm very happy with it! Thank you for sharing this. What an awesome recipe! I particularly like the roasted red pepper. Great idea. Back in the day when I used to make salmon croquettes I always used a little mayonnaise and some mashed potatoes to help bind and bulk the croquettes. I did the same thing using vegan mayo and a small yellow potato. The cakes hold together very well making them easier to handle and fry. I use a small amount of mashed potato to help hold the cakes together. This is an altogether awesome recipe! I use a small amount of mashed potatoes to help hold the patties together. This is an awesome recipe and I am charmed by the addition of the roasted red pepper. Genius! Thanks. I’m late to the party with trying this recipe but I tried your vegan lobster rolls over the summer and when I encountered these, I knew I had to try them. They were delcicious! My non- vegan husband, who loves crab, loved these. A few tweaks I made: I used gluten free panko breadcrumbs and they seemed to work fine. I am also watching my oil intake, so I chose to splurge on the vegannaise dipping sauce. Instead I sprayed them with a little avocado oil spray and baked them at 450 for about half an hour or so. I’m sure they weren’t as crispy or moist, but they were still delicious and browned up nicely. Thanks for your feedback and glad you were able to tweak with good results … so happy you enjoyed!